Download and enjoy this new, modern version of the Bible: New King James Version. NKJV translation was published in 1982. The aim of its translators was to update the grammar and vocabulary of the King James Version, the most renowned Bible of all time. Today the NKJV is the third most read Bible after the New International Version and the King James Version. New King James Version app is an amazing tool for study the Bible. It offers a clean and readable interface with a beautiful design. This intuitive app allows you to highlight verses, take notes, share contents and dig deeper into God’s Word. For those who love listening to the Bible, we offer an audio version of the scriptures. Listen to the Word every day on your phone! 2- Audio version of the Bible. Hear and read the Bible at the same time! Choose the book you want to hear! You can download the Bible on your device and use it offline. You will never need an internet connection to study, read or listen to the Bible anywhere! 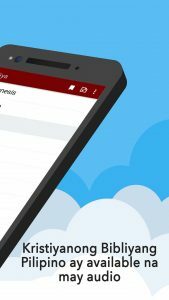 Tap on any verse to bookmark it and create a list of favorites. Customize your NKJV Bible with personal notes. With a few taps, you can easily navigate to any book, chapter, and verse. Share your favorite verses with your loved ones on any social media. The Bible offers many scriptures that can provide the best inspiration and strength throughout the day. Make the Holy Word a priority in your life. Discover the best audio app to read or listen to the Bible! The Pentateuch includes Genesis, Exodus, Leviticus, Numbers, Deuteronomy. The Historical books include Joshua, Judges, Ruth, First Samuel, Second Samuel, First Kings, Second Kings, First Chronicles, Second Chronicles, Ezra, Nehemiah, Esther. The Poetic and Wisdom writings include Job, Psalms, Proverbs, Ecclesiastes, Song of Solomon. The Major Prophets include Isaiah, Jeremiah, Lamentations, Ezekiel, Daniel. The Minor Prophets include Hosea, Joel, Amos, Obadiah, Jonah, Micah, Nahum, Habakkuk, Zephaniah, Haggai, Zechariah, Malachi. The New Testament consists of the Gospels, Acts, the Letters of Paul, the Epistles, and the Apocalypse. The Gospels: Matthew, Mark, Luke, John. Paul’s Epistles: Romans, 1 Corinthians, 2 Corinthians, Galatians, Ephesians, Philippians, Colossians, 1 Thessalonians, 2 Thessalonians, 1 Timothy, 2 Timothy, Titus, Philemon, Hebrews. General Epistles: James, 1 Peter, 2 Peter, 1 John, 2 John, 3 John, Jude. Ibinibigay ng app na ito ang Bibliya sa wikang Tagalog o Pilipino. I-download ito nang libre at basahin o pakinggan ito kailan mo man naisin. Magkakaroon ka ng Bibliya sa iyong mga kamay: isang click lamang at mayroon ka nang access sa Banal na salita sa iyong smartphone! – Sa sandaling i-download mo ang gusto mong pagsasalin ay maaari mo na itong pakinggan, online o offline, kahit na hindi ka konektado sa Internet! – Ang Bible app na ito ay isang audio na bersyon ng Bibliya, na kung saan nagpapahintulot ng pakikinig sa lahat ng mga kapitulo, at mga bersikulo ng mga Banal na Kasulatan. Maaaring i-adjust ang lakas at bilis ng audio sa iba’t ibang mga lebel. – Ito’y ganap na libre! I-download ito ngayon! – Ang Bibliya ay maaaring ma-access online o offline, at maaari ka mag-share ng mga bersikulo sa iyong mga kaibigan gayon din ang pagbo-bookmark ng mga bersikulo at lumikha ng isang listahan ng mga paborito. At saka, magsulat ng mga tala sa pag-aaral habang ikaw ay nagbabasa! – I-adjust ang laki ng mga sulat ayon sa nais mo. – Sa kaso ng pagbabasa sa gabi, maaari mong i-set ang night mode para protektahan ang iyong mga mata. Ang Bibliya ang pinakabinabasang libro sa mundo, ito’y isinalin sa mahigit na 2000 mga wika at nai-print sa mahigit 6 na bilyong mga kopya ng Bibliya. Ngayon ay maaari mo na itong ma-enjoy sa napakadaling gamiting Bible app na ito sa iyong smartphone o tablet. Milyong mga tao ang nagbabasa ng Bibliya mula sa isang Bible app at dinaragdagan ang kanilang kasiyahan sa buhay. Mga nasa 40 iba’t ibang may-akda ang nagsulat sa Bibliya sa loob ng 1500 taon sa tatlong magkakaibang wika (Hebreo, Griyego, at Arameik). Sa kabila ng gayong pagkakaiba-iba, ang Bibliya ay mayroong isang pagkakaisa na nagpapaliwanag sa banal na akda. Isang aklatan ng sagradong mga libro ang kahanga-hangang librong ito, na hinati sa Luma at Bagong Tipan. Mayroong mga pangunahing dibisyon sa Lumang Tipan at Bagong Tipan. Pentateuch ang terminong inilapat sa unang limang libro ng Bibliya:Genesis, Exodo, Levitico, Mga Bilang, Deuteronomio. Kabilang sa Historikal na mga libro ang:Josue, Mga Hukom, Ruth, 1 Samuel, 2 Samuel, 1 Mga Hari, 2 Mga Hari, 1 Paralipomeno,2 Paralipomeno, Ezra, Nehemias, Ester. Kabilang sa mga isinulat na Tula at Karunungan ang:Job, Awit, Kawikaan, Mangangaral, Awit Ni Solomon. Kabilang sa Pangunahing mga Propeta ang:Isaias, Jeremias, Panaghoy, Ezekiel, Daniel. Kabilang sa Minoryang mga Propeta ang:Hosea, Joel, Amos, Obadias, Jonas, Mikas, Nahum, Habacuc, Sofonias, Hagai, Zacarias, Malakias. Binubuo ang Bagong Tipan ng mga Ebanghelyo, Gawa, mga Sulat ni Paul, Mga Sulat, at ang Katapusan. Mateo, Marcos, Lucas, Juan, Mga Gawa , Roma, 1 Corinto, 2 Corinto, Galacia, Efeso, Mga Taga-Filipos, Mga Taga-Colosas, 1 Mga Taga-Tesalonica, 2 Mga Taga-Tesalonica, 1 Timoteo, 2 Timoteo, Tito, Filemon, Mga Hebreo, Santiago, 1 Pedro, 2 Pedro, 1 Juan, 2 Juan, 3 Juan, Judas, Pahayag. Biblia de estudio es fácil de leer y ayuda al lector a comprender el profundo significado de las Escrituras. 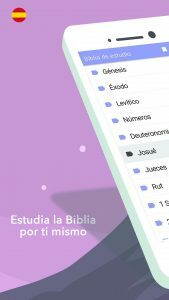 Biblia de estudio tiene audio y funciona offline. 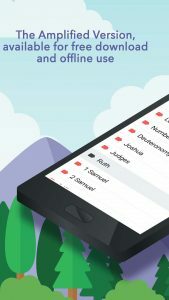 Puede leer o escuchar la Biblia sin conexión después de descargarla en su teléfono o tableta. No necesita de ninguna conexión a Internet. ¿No es eso una bendición? Si por alguna razón no puede leer la Biblia, dispone de su versión audio: ¡Escuche la Palabra de Dios! Puede buscar fácilmente cualquier palabra, versículo o libro utilizando nuestro sistema de búsqueda rápido y eficiente. Mientras lee la Biblia, toque el versículo que desea marcar y cree su propia lista de favoritos. Elija el tamaño de la letra de su Biblia para una mejor experiencia de lectura. ¿Se cansa la vista cuando lee la Biblia por la noche? Selecciona el modo nocturno para oscurecer la pantalla y hacer la lectura mucho más fácil! ¡Biblia de estudio será su aplicación favorita! ¡Lea o escuche la Biblia todos los días y convierta la Santa Palabra en parte de tu vida diaria! La Biblia está dividida en el Antiguo y en el Nuevo Testamento. This app allows you to both read and listen to the Amplified Version of the Bible. The Bible easy to read and understand that includes amplifications to assist the reader in understanding what Scriptures say. Reading the Holy Bible has never been that easy, simple and free! Download now and share what you learn with your friends and family! The Amplified Bible offline app comes with an audio, and offline mode. You can read or listen to the Bible offline after downloading it on your phone or tablet. You do not need any Internet connection. Isn’t that a blessing for all the Christians? 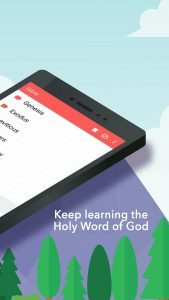 This Bible app is available to anyone for free download and offline use. For those who can’t read the Bible, we added an audio version of the Bible: listen to all the verses! You can quickly search for any word, verse or book by using our fast and efficient search system. 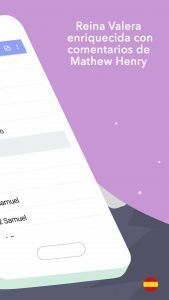 As you are reading a Bible verse, tap the verse you want to bookmark and create your own list of favorites. Eyes feel tired during night reading on the phone? Switch to night mode and the display is much easier on your eyes! 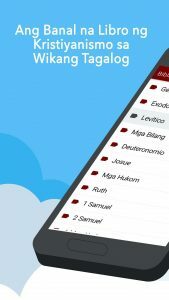 Amplified Bible offline will be your favorite app! Read or listen to the Bible every day and make the Holy Word a part of your daily life!